Is it time to embrace the so-called “Anthropocene”—the age of human dominion—and to abandon tried-and-true conservation tools such as parks and wilderness areas? Is the future of Earth to be fully domesticated, an engineered global garden managed by technocrats to serve humanity? The schism between advocates of rewilding and those who accept and even celebrate a “post-wild” world is arguably the hottest intellectual battle in contemporary conservation. In Keeping the Wild, a group of prominent scientists, writers, and conservation activists responds to the Anthropocene-boosters who claim that wild nature is no more (or in any case not much worth caring about), that human-caused extinction is acceptable, and that “novel ecosystems” are an adequate replacement for natural landscapes. With rhetorical fists swinging, the book’s contributors argue that these “new environmentalists” embody the hubris of the managerial mindset and offer a conservation strategy that will fail to protect life in all its buzzing, blossoming diversity. 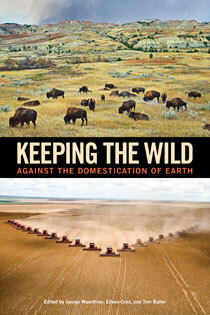 With essays from Eileen Crist, David Ehrenfeld, Dave Foreman, Lisi Krall, Harvey Locke, Curt Meine, Kathleen Dean Moore, Michael Soulé, Terry Tempest Williams and other leading thinkers, Keeping the Wild provides an introduction to this important debate, a critique of the Anthropocene boosters’ attack on traditional conservation, and unapologetic advocacy for wild nature. "As an account of underlying concepts, the history of ideas, and neo-green philosophy...this book is outstanding." "...an invaluable read for those who love wild places." "...[T]he book contains thought-provoking and damning examples of how the 'Neo-greens' have abandoned the preservation of Nature in favor of human re-engineering of the earth's natural ecosystems and dwindling wilderness." "We all need to read [Keeping the Wild] and become fully aware of the dangers it describes. We need to familiarise ourselves with all the arguments these writers have so clearly and thoroughly articulated if we are to have any hope of countering the insidious Anthropocene trend before it gets any further entrenched." "In a collection of thoughts from prominent conservationists, editors Wuerthner, Crist and Butler build their case against our move toward the anthropocene, where there is a focus upon human dominance over the environment." "...a high quality collection of essays"
"I found all the essays well written ... thought provoking. ... I recommend the book to any resource manager who must consider the diverse and often conflicting views of various entities when resolving natural resource issues." "Keeping the Wild isn't a potboiler; it is a pot-stirrer. If the book doesn't succeed in igniting real debate about the direction of the conservation movement, then perhaps it will at least jolt the green establishment out of its uninspiring narcolepsy." "a seminal body of impressive scholarship throughout and very highly recommended"
"...contribute[s] to an important and unfolding dialog..."